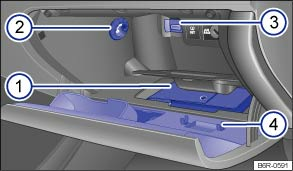 The stowage compartment on the front passenger side is intended for the vehicle wallet. 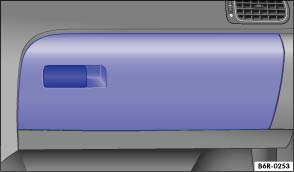 The vehicle wallet is stowed at the bottom of the stowage compartment . The vehicle wallet should always be kept in this compartment. Grasp the side of the vehicle wallet and put it out upwards. Insert the vehicle wallet into the stowage compartment. A multimedia socket (MEDIA-IN) may be located at the top of stowage area ⇒ BookletRadio, or ⇒ BookletNavigation system, . There is a glasses compartent, a card holder, a pen holder and coin holders on the inside of the stowage compartment flap . There is a vent in the side panel . If the air conditioning is switched on, cooled air can be fed into the compartment. Turn the vents to open and close them. If the stowage compartment on the front passenger side is left open, this can increase the risk of serious injury in the event of an accident or during sudden braking or driving manoeuvres.